HVAC, particularly the cooling component, is the biggest energy user in office buildings. Billions of square feet of office buildings have no received their federal energy benchmarking rating. On September 25, 2013, New York City published ratings on over two billion square feet of buildings with the largest category being office buildings. Since the entire state of California, including Los Angeles, San Francisco, and San Diego, and seven other major cities have mandatory energy benchmarking, office buildings are the largest category of buildings with benchmarking data. New HVAC tax incentives effective January 1, 2014 help property owners make HVAC investments that reduce building operating costs and increase energy benchmarking ratings with favorable tax treatment. Buildings in New York City, Seattle, Austin, Washington D.C., California, Philadelphia, Minneapolis, and most recently Boston and Chicago, are required to be annually benchmarked for energy and water usage. The law requires benchmarking by major individual building categories including office buildings, hotels, schools, parking facilities, hospitals, warehouses, multifamily houses, and retail stores. It is be the building owner’s responsibility to gather the information and report it on the online database system provided by the U.S. Environmental Protection Agency (USEPA). This system, which is organized by what is called ESPM (Energy Star Portfolio Manager), will rate building’s energy usage in comparison to other benchmark buildings in the nation on a percentile scale of 1 to 100 (1 being the least energy efficient building and 100 being the most energy efficient building). It is the owner’s obligation to continue with mandatory benchmarking rules annually. To date, large building owner operators have been the most frequent users of Energy Star benchmarking data. Fortunately the benchmark data input process is relatively straight forward, and all the information is disclosed to the public, so comparisons can be made and contrasted to other buildings that are similar within the nation. Energy benchmarking can be further strategically utilized by the owner in order to improve their building’s energy performance, lower their energy consumption, and increase cost energy savings1. A summary of the energy benchmarking requirements per jurisdiction are illustrated in Figure 1.
Who Benefits from Mandatory Benchmarking? Tenants: First and foremost, office building tenants are the primary intended beneficiaries of building energy benchmarking. Before signing a new lease or renewing an existing lease, a tenant should review the benchmarking results. Tenants should negotiate lower rents in underperforming buildings. Landlords: Sophisticated office landlords with high performing buildings can tout the cost advantages of leasing their energy efficient buildings. Landlords with underperforming buildings can make HVAC upgrades and other investments that will markedly improve their ratings. Real Estate Fund Investors: Investors in real estate funds can determine which funds have higher performing, hence higher value buildings. Utilities: Utilities confronting electricity generation limits can determine where there are opportunities to promote efficiency and reduce demand. Reducing demand may enable a utility to reduce large power plant capital investments2. This is particularly important in jurisdictions with coal powered power plants that are confronting billions of dollars of added capital investment to reduce emissions pursuant to new EPA mandates. Our view is, to be considered a Class A office building, a building should have a rating of 75% or higher. The average reporting NYC office building has a rating of 67%. Office building owners who replace existing HVAC and meet the betterment, adaptation, and less than 50% of HVAC system tests, may qualify for large tax incentives under the new law effective January 1, 2014. When making these decisions, building owners should engage knowledgeable building tax experts with HVAC engineering backgrounds to prepare supporting HVAC tax incentive study documentation. Our firm, Energy Tax Savers Inc., obtained the first, and we believe only, office building ruling in this area3 which illustrates a million dollar chiller that met the betterment, adaptation, and replacement tests in effect at the time of the ruling. HVAC tax incentives may be available to both large office buildings replacing chillers and small office buildings replacing package units. 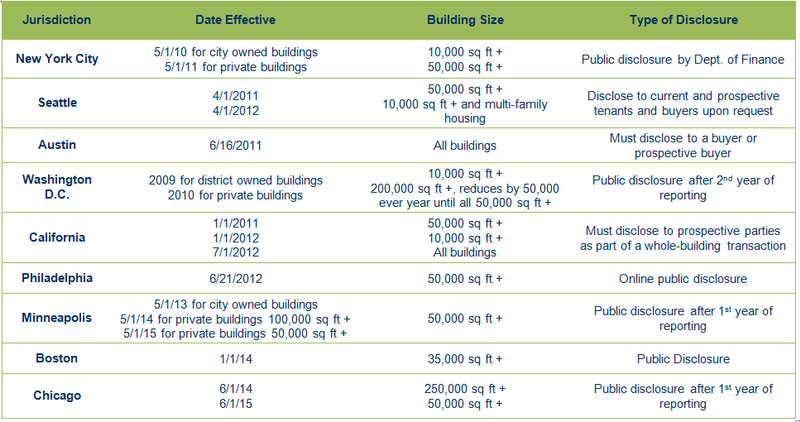 Tenants evaluating new and renewal lease space should ask the landlord to provide energy benchmarking data. Presumably, underperforming buildings should be offering rent allowances and/or commitment to retrofit. 1 - “Famous NYC Low Energy Performing Buildings Draw Media Attention and Tax Opportunities”, Charles R. Goulding, Andrea Albanese, and Charles G. Goulding, ETSI Publishing, February 2013. 2 - “U.S. Utilities Combine EPAct Tax Savings with the Rosenfeld Curve”, Charles Goulding, Jacob Goldman, and Lynn Bertrand, Corporate Business Taxation Monthly, April 2013, at 15.